The Bureau of Land Management (BLM) announced today the Final Moab Master Leasing Plan that will bring balanced zoning for oil, gas and potash development in and around the Moab area, including the federal lands between Arches and Canyonlands national parks. Master leasing plans are the BLM’s most effective tool to keep up with our changing and growing economy. Because they are prepared with local communities, stakeholders and businesses, they represent a shared, collaborative vision for how our public lands should be managed. 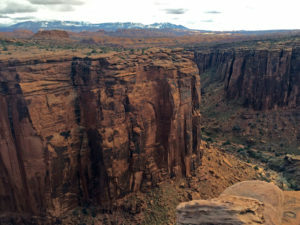 This breakthrough leasing plan for the Moab area is the result of years of cooperation between a wide range of local and regional stakeholders, the Department of the Interior (DOI), and state and local officials. The Moab MLP has been touted as the blueprint for stakeholder engagement during the years-long planning process. Participants in the Moab MLP came from a wide range of interests for stakeholder meetings to discuss their land use priorities, including representatives from the recreation community, industries such as oil and gas and potash, local elected officials, environmental groups, and more. Together, local and regional stakeholders crafted a plan that will contribute to the economic prosperity of southeastern Utah for years to come. The result is a balanced plan that protects recreation opportunities and cultural resources while also allowing for resource extraction where appropriate. Copies of the Final EIS are available online and will ultimately be available at the BLM Utah State Office in Salt Lake City, the Canyon Country District Office in Moab, and the Monticello Field Office in Monticello.